The Honourable Leader of the Opposition, Mr. Sampanthan has raised several important questions in this adjournment motion debated today but due to time restraints, I will speak out first on the matter of families of the disappeared and the missing. The issue of missing persons is one that is very close to my heart. In fact way back in 1989, I along with Hon. Mahinda Rajapaksa at that time were the core joint conveners of the Mothers Front Movement which was formed to deal with the missing people in the South during that era. In fact over the years, I have personally fought for the rights of the families of the missing, the pain and anguish of parents who have lost their children both in the North and the South, wives who have lost their husbands, sisters and brothers who have lost their siblings, is the same everywhere. In fact human grief has no colour, no race, no caste, no religion. Since the new government assumed office in September following the general election, we signed as Hon. Sampanthan said earlier, the Convention against Enforced Disappearances. Actually I believe on the Human Rights Day on the 10th of December last year with the clear objective to ensure that the white van culture and the years and years of enforced disappearances that took place all over the country would be confined to the history books (and) would be a thing of the past. This we are determined to achieve through firm action. In fact we are now in the process of drafting the legislation and hopefully within the next two months, the legislation will also be brought here to the house. No other government has taken this step for long years despite repeated calls to take action in this regard. We took the first step of signing the convention and I said we are now proceeding to work on enabling the legislation and I can assure the house that the work is currently underway to give legislative effect to the provisions of this convention hopefully within the next two months. As a measure of immediate relief to the families of the missing, the Cabinet of Ministers approved the issuance of Certificates of Absence in September, 2015. It is a matter of regret that the legislative amendment that is required to give effect to the issuance of this certificate has still not reached Parliament but my colleague, the Hon. Minister of Justice, has assured us that it will be done so in the very near future. However this matter is being closely followed by the Office of National Unity and Reconciliation and I’m hopeful that this much needed and much awaited piece of legislation would soon be passed enabling the families of missing persons to obtain Certificates of Absence. Just recently the ICRC also completed as you know, a needs assessment of the families of the missing and this was shared with the government late last month. ONUR and my ministry with a host of other line agencies are in the process of studying this to identify and address pressing issues of the families of the missing. I pledge that we will expedite action to explore what interim relief can be provided to the families of the missing. I urge the Honourable Members of the Parliament to also join the Government in assisting this task by suggesting measures that can be taken. In the meantime as I have mentioned before, the Government has worked on a concept note together with the ICRC for the establishment of an Office of Missing Persons by statute which will carry out its work on the basis of the families’ right to know. This House is very well aware of the many commissions of the past that were established to look into missing person issues. There were several in the past including the current one which we intend on winding up that was appointed by the previous administration. This House is aware that these commissions were all established on an ad-hoc basis and in a hurry with no consultations locally or with experts outside who are knowledgeable on these issues. As a result, the commissions have been plagued with problems and shortcomings and the families of the missing have had little or no relief. In fact we want to ensure that we avoid these mistakes of the past, neither do we wish to establish mechanisms just to please the international community or to meet various deadlines. As Hon. 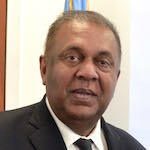 Bimal Rathanayake very correctly said, we are meeting our commitments to the long suffering people of this country not because of international pressure, not to appease the international community but because our Government, the Government of President Sirisena and Prime Minister Wickremesinghe sincerely believe that we must address the past, we must come to terms with our past if we are to move forward boldly as a nation. I know very well however that for the family members who suffer daily, for those who grieve each day, is a nightmare. Any delay in the part of the authorities even if such a delay is to ensure that they are better served is no solace to them. However I urge you to bear with us a little longer, perhaps until the end of this month or before, allowing us time to consult experts to ensure that before we go to Cabinet to seek approval to establish this permanent office, we get things right at least this time. In fact at the moment we have also a team in South Africa, a technical team, who is also looking at the various aspects of the South African Truth Commission. Of course, I personally believe that while there are many things that we can learn from South Africa, what we finally decide for Sri Lanka must be uniquely Sri Lankan, addressing the needs of our own country and this Government is determined to what is right by the victims and the families of the missing. As for the other, another important issue Hon. Sampanthan raised, the Prevention of Terrorism Act, I believe and I believe and know that our Government believes is that the PTA has no place in its current form in a democracy such as ours. I did say this in my address to the governing council of the Community of Democracies just last Wednesday in Geneva. In fact the Honourable Leader of the Opposition, I urge you to know what our views are on this subject and we also agree with your argument and as you know we have been discussing with the various authorities involved in expediting the release of these prisoners as soon as possible. In fact the Government I agree has given repeated commitments to this very House to look into the question of detainees. Some who are on trial have been released on bail but there are some who continue in detention while on trial. The problem for those who are facing trial is that their cases have not been concluded as speedily as expected and continues to drag on. In fact I’m aware of the efforts, and we appreciate the efforts taken by the Honourable Leader of the Opposition here and some members of the Parliament of TNA to urge the detainees who have commenced a fast unto death, to discontinue its action and allowing us space to address this serious issue in a meaningful and sensible manner. Some have listened to reason and given up their fast while some still continue. The lives of each of these detainees, I say with all sincerity, matters a great deal to us. We are a Government that has pledged to uphold and promote and protect the human rights and dignity of all. We lost too many lives on all sides in all parts of our country for long years as a result of action of this nature and as a result of violent conflict. We cannot afford repetition. We don’t want to see repetition and we cannot lose any more lives in connection with the conflict that is long over and if we want to ensure non-recurrence, this is the moment in time, moment in history where we have to win everyone over. The hearts and minds, as President Sirisena constantly says, are more important than the bricks and mortars of development. I admit that there have been delays in addressing this important issue. It is against our collective conscience in this House to allow this situation to continue this way and we must as a Government make a special effort even at this late hour to address this issue expeditiously. In fact tomorrow some of our Ministers want to go and meet some of these detainees ourselves and speak to them and we have also asked the Minister of Justice to expedite this process and to get the Attorney General’s Department to take some action speedily in this regard. There’s much more I would have liked to have said but due to restraints of time, I’d like to thank you again for allowing me to speak. Is Having To Pay For Tomato Ketchup Racist?